With the success of this summer’s ‘The Avengers’ as well as his own movie – and with a sequel in the works for both – Captain America is back and bigger than ever. 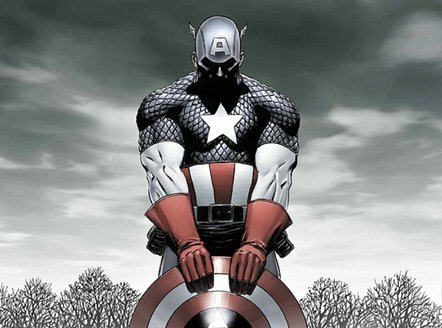 The living symbol of WWII patriotism, the “super-soldier” created another huge hit for Marvel/Disney, and it’s about time. 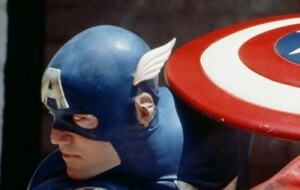 Because as great a character as Cap is (I call him ‘Cap’; we’re bros), his filmed adventures have been, umm, hit and miss. Mostly miss. You probably know the story: during the Second World War, puny but patriotic Steve Rogers is given an experimental formula and a REALLY busy outfit with a cool shield and becomes Captain America! The hero of the war ends up lost, in suspended animation, until he’s revived many years later, at which point he resumes his battle for justice. 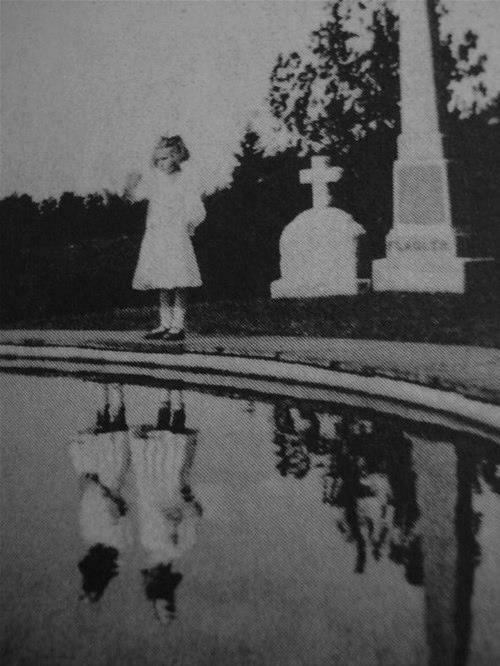 Keep this in mind; the story’s gonna get confusing as we go along. In the 1940′s, serials were a big part of going to the movies. Most comic book and newspaper strip characters got their first live-action adaptation in the form of a chapter serial. And the undisputed king of serials was Republic Pictures (the king of cereals was probably Corn Flakes; King Vitamin didn’t come along until years later). And in fact, 1944′s ‘Captain America’ is considered one of the best superhero serials ever made – but not THE best; Captain Marvel holds that title. This is strange, because if you watch it, you’ll soon discover that this thing barely resembles Captain America at all, except for the costume! 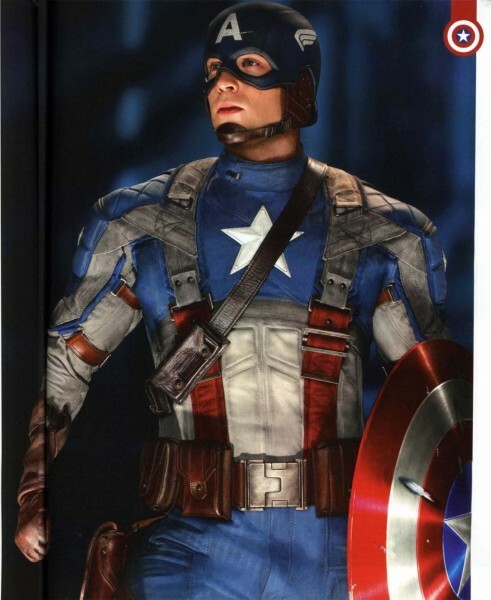 For instance, this version of Cap is not a super-soldier. Heck, he’s not a soldier at all! District Attorney Grant Gardner is secretly the heroic Captain America, who must face the sinister Scarab. Captain America doesn’t even have a shield in this thing. He has a gun. And under the circumstances, his outfit and patriotic sobriquet don’t really make any sense. Oh, well, at least he rides a motorcycle. Despite these inexplicable changes, the serial was quite popular. Good thing, too, because things were about to get weird. The 1970′s are hard to explain. You kind of had to be there. But superheroes got really popular again. Captain America had been limited to comic books and cartoons in the decades since the 1940′s (and really, he wasn’t in those much until the 60′s), but in 1978, he was BACK! Sort of. 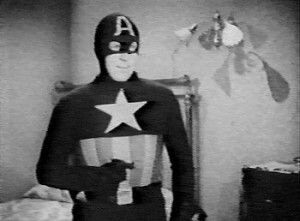 See, the TV movie (which was intended as a pilot to a series) deals with Steve Rogers, yes, who is indeed given a super-soldier serum and becomes Captain America, but THIS Steve Rogers (played by Reb Brown – remember him? No, no one does) is the SON of the original. Sort of. 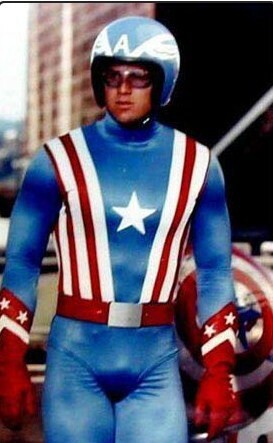 In the first movie (yes, there were TWO) Steve’s late father is described as patriotic, yes, but not as wearing the costume. Apparently, “Captain America” was a nickname his enemies used as an insult. Except at the end of the movie, when it’s suggested that the old man DID wear the costume! I feel a headache coming on. So this Steve Rogers is a mellow dude, an artist by inclination, who gets swept up in a big bunch of intrigue and mystery. He’s then given the super-steroids or whatever, a tricked out van and motorcycle, and the shield, along with a motorcycle outfit. Umm, yeah. See, in the 1970′s, there was this guy called Evel Knievel – ask your parents if you’re too young to remember. This Cap kind of has a Knievel vibe. So his superhero outfit is very much a one-piece motorcycle suit with matching helmet in a Stars and Stripes motif. Oh, and his shield is Plexiglass or something, and doubles as his bike’s windshield. In the sequel, 1980′s ‘Captain America: Death Too Soon’, Cap’s motorcycle suit at least KIND of looks like the comic book character (because at the end of the first movie, he said he wanted an outfit more like his Dad’s – remember me talking about this earlier? ), and this one also has the minor advantage of a slumming Christopher Lee as the villain. But these didn’t go anywhere. 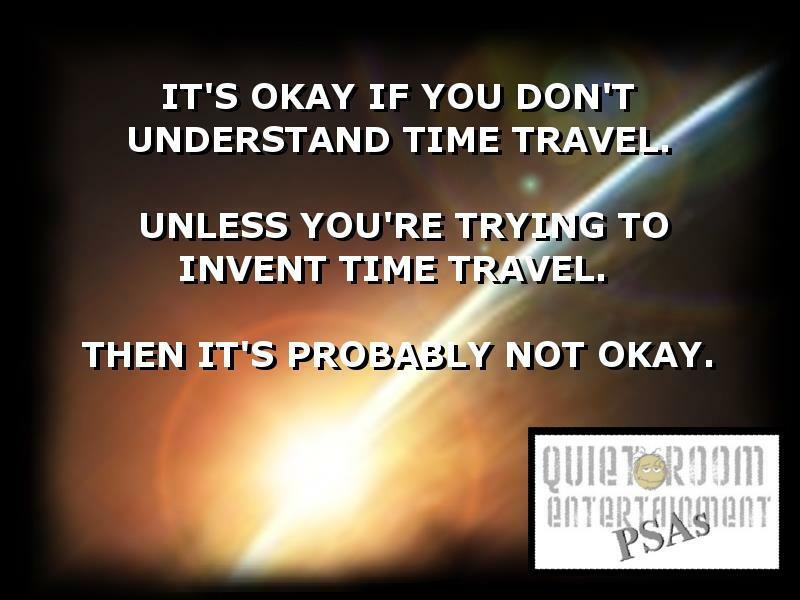 I’m gonna take a moment to say what old folks like me say a lot: people today don’t appreciate how good they have it. 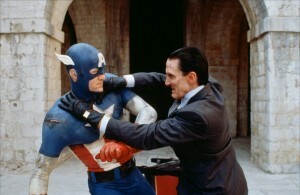 These 70′s Captain America telefilms are considered pure hokum nowadays. When I was a kid, everyone I knew (five year olds) was THRILLED with them! We didn’t have the giant, multimillion-dollar spectacles of today, so we didn’t notice how silly Cap looked or how flimsy that shield was. It was CAPTAIN AMERICA, dammit, and that was good enough for us! I bought these last year when they came out on DVD. Don’t regret it one bit. They’re lame, but they’re my childhood. Anyhoo, this began another hiatus for the Star-Spangled Avenger, until the next superhero renaissance in the wake of ’89′s Batman movie. Now, I’ve said nice things about the Republic serial and managed to wax nostalgic over the TV movies. Sadly, 1990′s ‘Captain America’ is a little harder to praise. They try. Really. 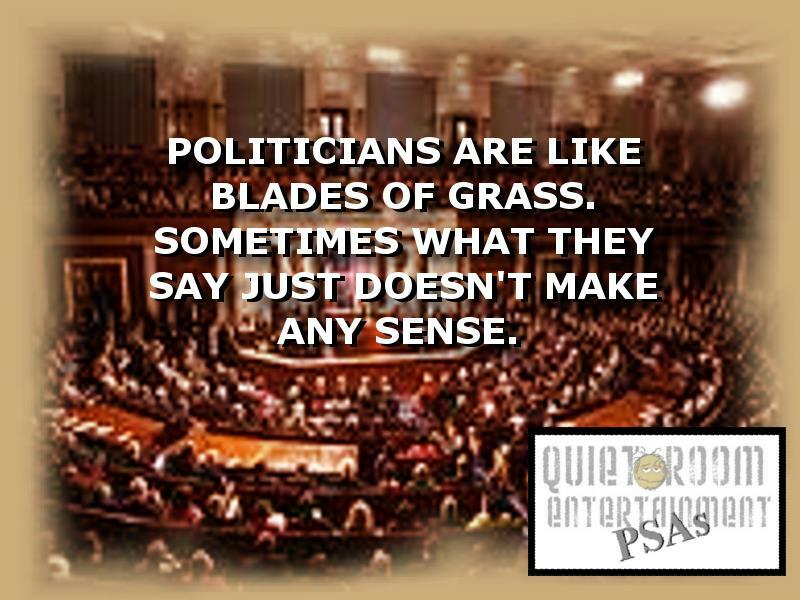 And they get SO much right! 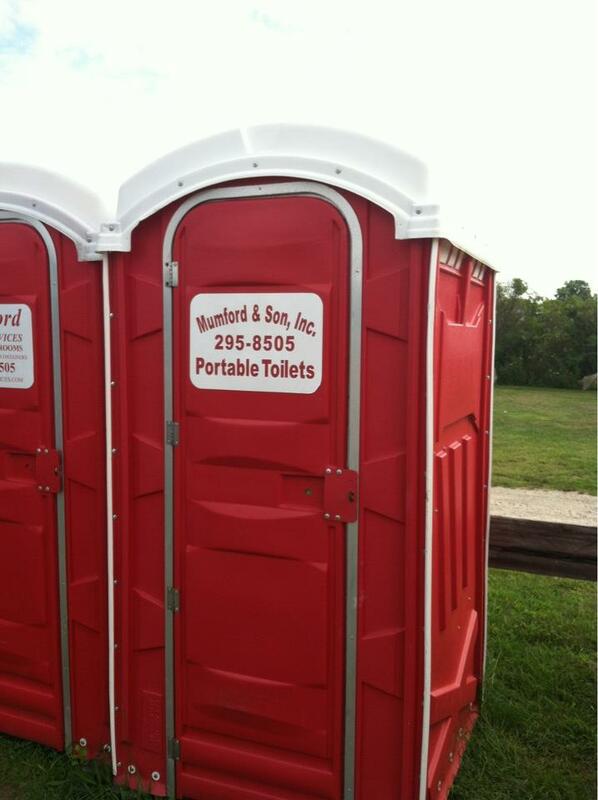 I’m convinced if they’d had a better budget, this one might have worked. But, err, no. The plot, when described, sounds perfect: weakling Steve Rogers is dosed with super ‘roids, sent after Nazis, is defeated by the evil Red Skull and ends up in suspended animation. He’s revived in the present day and is now a man out of time, struggling to adjust to a radically different world that has moved on without him, while also having to face the Red Skull once more. See? Sounds great, right? WRONG. It’s hard to explain what the problem is, exactly. The low budget, for starters. The Red Skull being Italian and an unwilling victim of the Nazis doesn’t help much – nor does the fact that the villain only looks vaguely like a red skull at the beginning of the film and spends the rest looking like a wealthy accident survivor. But what really gripes many people is the rubber ears on the Cap costume. 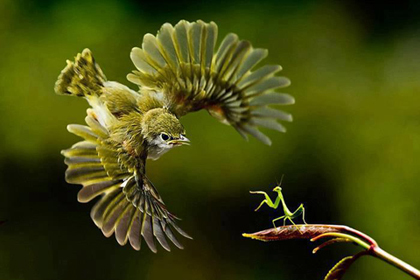 The better to hear you with, my dear! Just kidding - I can't hear a damn thing through this mask. See, the comic book Cap wears a mask which has openings, apparently, for his ears to stick out. Yes, this is stupid, but that’s what they drew, okay? So the costume designers for this movie gave Cap the (at that time) required rubbery outfit, padded muscles and, I’m serious, sculpted rubber ears onto the mask. Why? No idea. The actor, Matt Salinger, has ears, so really, there’s no good reason for this. They’d have been better off just covering up the ears and not worrying about it, but hey, hindsight is 20/20, right? This movie flopped miserably. It’s not unwatchable, I’ll give ‘em that. It’s just unworthy of a character who, by rights, should be up there with Superman and Batman when it comes to filming his adventures. It would be 20 more years until someone got it right. 2011′s ‘Captain America: The First Avenger’ was a great movie, a great superhero movie AND a great Captain America movie – the first time anyone managed all three in one production! The origin story, the WWII setting, the Red Skull, the tie-ins to the larger Marvel Movie Universe, the nods to both the comics and earlier adaptations; this is the one to beat. I’m a DC fan at heart, but I have to say, this Cap blew me away! I was VERY impressed with the tone and look of the thing. Finally, Captain America as we always imagined him! The 2012 movie ‘The Avengers’ features a revived Cap, with a new outfit, leading a motley crew of superpowered folks against otherworldly menaces. It was a huge hit, and both this ensemble film as well as the individual characters are all getting sequels soon. So that’s it, so far. Since Joe Simon and Jack Kirby first created Captain America in 1941, the character has been adapted every few decades. They usually got more wrong than right. Looks like now, the super-soldier finally gets to let his flag fly.